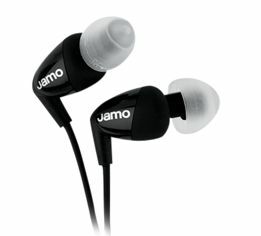 Jamo IN40i review | What Hi-Fi? Play something stripped-down, like Ben Howard’s Old Pine, and the Jamos immediately please thanks to a luscious, rich bottom-end. The problem is that as tracks build, the bass feeds up to the mid-range and slightly drowns out the treble. They’re still very chunky and enjoyable, though, and the remote/mic makes them handy for iPhone users.